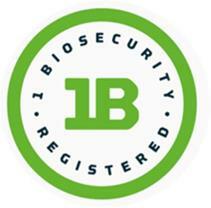 The information and data about individual enterprises contained on One Biosecurity and in associated documents is provided by the account holders. The Government of South Australia, its agents, instrumentalities, officers and employees give no warranty and make no representations, express or implied, as to the accuracy, completeness or fitness for purpose of this information and data. Verification by PIRSA indicates only that some of the information provided by the account holder in relation to their on-farm practices was accurate at the time and date of verification. Use of this information and data is at the user’s sole risk and if you rely on the information on this site you are responsible for ensuring by independent verification its accuracy, currency or completeness. The Government of South Australia, its agents, instrumentalities, officers and employees accept no liability however arising for any loss resulting from the use of the site, any information or data contained within One Biosecurity or associated documents, or reliance placed on it.